We offer a cutting service on all our material. In-house, we can cut up to 457mm / 18″ diameter bars and have an excellent relationship with cutting specialists sub-contractors who can cater for the larger sizes. 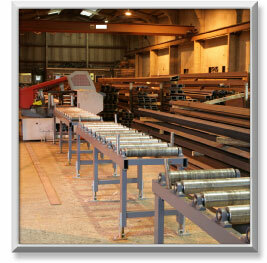 Our fully automated band saws operate 24 hours a day, 7 days a week allowing very quick lead times on cut pieces. Usually we supply cut pieces from stock material to our customers within 2-3 days. As well as having our own transport we also work closely with approved haulage companies, so the material is always with the customer the day after they leave our warehouse.